About three weeks ago, I caught a show I'd never seen before. One of those shows that no one is talking about and no obnoxious commercials have informed me is now a necessary part of my identity if I want to continue being the extra hip and cool person I am. Flipping the channels, I land on a tall, crazy-haired blonde Aussie in what looks like my Gelson's. Flanked by a fifteen person light, sound and camera crew, he roams the isles, eventually spotting what he's come for: a woman with a coconut to her ear. "Shaking your coconuts, are you?" His smile is much bigger than hers. So is his resolve. He picks up a coconut too, shakes it and puts it to his ear. "What are we listening for?" The awkward pause, like everything about this show, is unscripted. Curtis Stone started in his native Melbourne at the Savoy Hotel, got his chef credentials and toured Western Europe for a while before moving to London. Before long, chef Marco Pierre White turned over his Soho restaurant Quo Vadis to Curtis. He's been the head chef at other restaurants, contributed to some cookbooks and hosted a few cooking shows on television. Who cares, right? My brother has been pleading with me to watch, Rick Stein, a British chef he discovered on Delta Airlines. My brother's wife is a chef and owns a Northern Italian restaurant, so his interest in cooking shows is to be expected. It's his job to be aware of culinary trends near and wide. I, on the other hand, struggle with a grilled cheese sandwich. Thanks to Corn Flakes and Greenblatts, the Jewish deli down on Sunset, I've managed to keep myself fed since moving from Macon, Georgia to L.A. ten years ago. Working in the entertainment industry led to many dinners at the restaurants you hear about. Most of them turned out to be yet another chapter of The Emperor's New Clothes, with an emphasis on seeing and being seen taking precedence over good cooking. And besides, nothing tastes as good as it does when Mama makes it. Those things combined have left me disinterested in food, on the whole. The premise is simple: Curtis finds you at the grocery store, asks a few questions about your life to decide what he's going to cook for you and your husband (or whomever you're cooking for tonight). He helps you shop, bums a ride with you, stops off at a Sur La Table or some gourmet shop and buys you a cool present (which he'll show you how to use later in your kitchen). When you get home, he carries the groceries in for you, and insists you go freshen up while he gets supper started. You get all dolled up and come back in to a fired up kitchen and together you cook a gourmet meal. Your husband comes home. Surprise! Here's a glass of wine for the two of you – relax and enjoy each other while Curtis finishes preparing your meal. And that's it. Nothing to it…but what Curtis Stone's TAKE HOME CHEF has got that's so different, is the everydayness of life. Someone comes along beside you for an afternoon. You're still doing what you do every day: planning dinner…shopping…cleaning up the kitchen…but now it's infused with new possibility. Sharing in the ordinary chores of the day somehow transforms them and inspires one to look at the day not as mundane, but as an adventure begging to happen. I stopped long enough to watch that day not out of any desire to learn to cook, but because I couldn't stop watching it. Don't misunderstand…he's a gourmet chef all the way. He's not a replacement for anything familiar to me. He's brand new. But something happened as I was watching that first time. I started thinking that it might be nice not to be at such a disadvantage when it comes to food. I started thinking that maybe it wasn't completely beyond my reach, this cooking thing that all my friends are always caught up in. I even started thinking of it in terms of fun that was passing me by. Last week I treated myself to a new knife. I asked the clerk, who was in culinary school, what kind of knife Curtis Stone used. She said, "Whatever he has in his hand…he's known for that." So I bought the knife I had in my hand. I also got a couple of wooden spoons, a grill pan, and a zester. My brother ordered Curtis' new cookbook (COOKING WITH CURTIS) for me. A good beginning. Here at HYENA there is nothing we love more than seeing the heart of an artist at play. 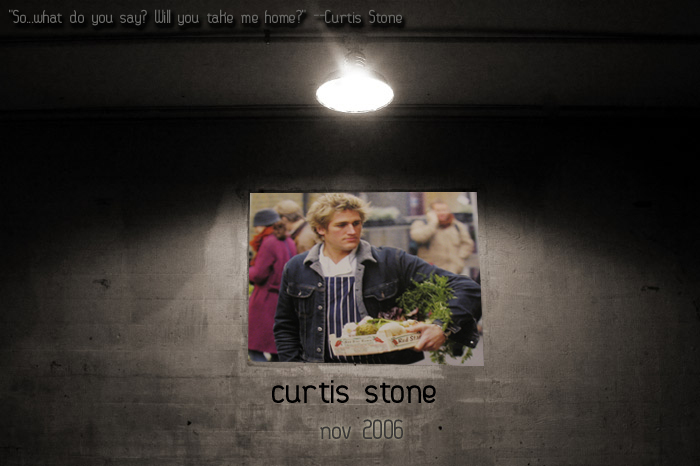 Check out Curtis Stone, if you haven't already, and see what we mean. Get yourself inspired! Order COOKING WITH CURTIS -- hot off the press! There's a bit of a wait, but that's how it is sometimes with the good stuff! TAKE HOME CHEF can be seen on The Learning Channel. You can read more about Curtis on the show's website here. You can also download loads of complete recipes created by Curtis Stone. Also visit Curtis' new website!